Clayton Thorson celebrates. The senior quarterback threw three long touchdown passes in Saturday's upset win at Michigan State. EAST LANSING, Mich. — It took Northwestern more than 50 minutes of game time to run a play in the red zone. It wasn’t for offensive failure. 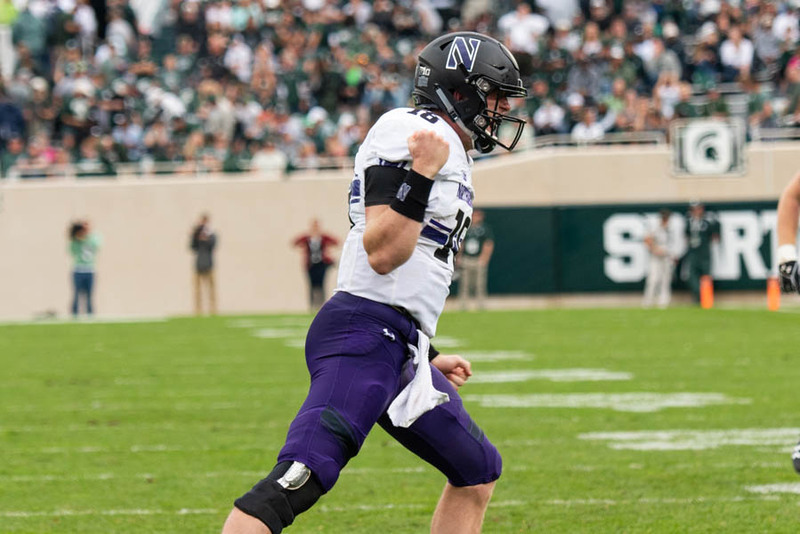 Instead, the Wildcats (2-3, 2-1 Big Ten) bypassed the final 20 yards to the end zone entirely, connecting on their first three touchdowns on long passing plays that formed the bulk of NU’s scoring in a 29-19 upset victory over Michigan State (3-2, 1-1) here on Saturday. In the offensive struggles that had pushed the Cats to three straight September losses, Thorson struggled to connect on downfield opportunities. Lengthy passes were dropped. The quarterback mistimed connections with receivers. Defensive backs made big plays. It didn’t take long for the Cats to cash in. Sophomore receiver Kyric McGowan slipped behind a cornerback late in the first quarter, and Thorson found him wide open for a 77-yard score that put NU on the board. Just 80 seconds of game time later, the gunslinger connected perfectly with freshman receiver JJ Jefferson, who lunged to the ground to snag Thorson’s dart, sneaking just inside the end zone to extend the Cats’ lead to two scores. And when NU faced adversity, trailing late in the third quarter after giving up a pair of touchdowns, Thorson made another excellent throw, hitting well-covered junior superback Cameron Green for a 21-yard score that put the Cats in the lead for good. The plays were as varied as they were significant. Fitzgerald credited a targeted scheme to get McGowan open for the first touchdown, and Thorson outmaneuvered the Michigan State defense to hit Jefferson, in one corner of the end zone, and Green, in another, with pinpoint throws. They all worked to perfection for the Cats, who had no touchdowns of more than 25 yards in their first five games; the longest touchdown play NU had registered in a conference game was a meager four-yard rush. But by the time the visitors on Saturday ran a play from such close range, they were closing out the final minutes of a statement victory — and one that was built on chunk plays.